Thinking about a Sailing Vacation? Perhaps you are a little intimidated by the process? Don’t worry, here are all the facts. But first, a fun slideshow from us. First off, you need to know that there is nothing more fun than a sailing vacation. And, if you can think of something more fun, then you can probably do it on a sailing vacation. LOL. Second off, it is relatively easy to do but you need to be a competent sailor and there are some things you need to know. What is a Charter? And What is “Bareboat”? A charter is just a fancy word for rent. So when you charter, you’re renting a boat. Typically, it refers to a longer period of time such as renting a boat for a week or more. Bareboat is a strange word, but it means you captain the boat yourself. So going on a charter essentially means going to a sailing destination like the Caribbean, Mediterranean or the Pacific and renting a 28-foot to 50-foot sailboat for about a week or two. You can sail it with you as the captain (Bareboat) or you can hire a captain (and/or a cook). Often times hiring a captain is a good way to go even if you are experienced because the captain is a local and knows all the cool places to go. A cook is also a great idea to relieve yourself of cooking; plus, they are experienced at whipping up some culinary delights in a cramped galley (kitchen). What comes with the Boat? The boat comes with a refrigerator and freezer, toilets, showers, hand basins, and cushions to sit on. Essentially everything except food and sundries. Some charter companies really look after their boats and some don’t; you have to rely on their social reputation if you’re going after one older than say about 7 years. Provisioning means buying all your groceries for the trip. Some yacht charter companies will provide this service for you (at a premium). Many times marina grocery stores have a website and are set up to deliver the groceries to your boat on the day of your arrival. Riteway.com in the BVI is a good example. Even if you own a boat, chartering a boat is the ideal way to see other beautiful parts of our planet. The cost of about $5k on the outset might seem expensive. But that is your walk away cost. Once you are done – you’re done with cost. Everyone that owns a boat knows that the purchase price is just the start of the costs of a boat. With chartering, you wipe your hands clean when you step off the dock on to terra firma. With Chartering, this year you can go to the Caribbean, and next year you can go to the Mediterranean, then the Pacific the following year. You’re not tied to a place. With Chartering, your sleeping quarters and entertainment costs are inherently included and many times you eat on board so you’re not paying restaurant prices for food. When you add it all up, it is a relatively inexpensive vacation. ESPECIALLY if you grab a bunch of friends and all split the cost. In that case, you can get it down to about $100 per day per person. Without a doubt, you will always be asked to give the yacht charter company your sailing resume. This will contain documentation of your past sailing experience, any sailing instructor on-the-water assessments, and any theory courses you have taken. For the Caribbean, you don’t need a formal license to bareboat charter (captain your own boat). Don’t believe any sailing associations who say you must have one. What you do need, however, is a good sailing resume. Clear your resume with the yacht charter company at the time of making your booking; NOT when you arrive at the base. For the Mediterranean, you will need a sailing license AND an acceptable resume. In general, Mediterranean countries accept your home country license as long as it is a government approved license. The NauticEd SLC™ is an acceptable sailing license. For the resume, a good rule of thumb to go by is that yacht charter companies will require about 50 days of sailing experience, 25 of which as master of the vessel and some of that experience should be on a vessel within 10 feet of your regular experience. You should also have some formal sailing theory knowledge displayed on your resume. Again, the NauticEd SLC will take care of that. NauticEd has an extensive Bareboat Charter Master bundle of courses for $175 that covers all this and more. Additionally, NauticEd has a FREE electronic resume and logbook system that helps sailors build an acceptable resume for yacht charter companies. It produces a real-time window into the student’s competence which helps a yacht charter company make a decision whether or not to rent you their 1/2 million dollar yacht and/or whether you will need a captain on board the whole time or for at least a checkout ride. Why use NauticEd as your Agent? This is important. When you use NauticEd as your charter agent, there is NO additional cost to you. For full disclosure, the charter company does give us a small “finders fee” on the back end at their cost. Why do they do this? Because it releases them from a lot of administrative burdens which we do instead. We use this money to help fund NauticEd become the most advanced sailing education company on the planet. In this manner, you are helping create better sailors worldwide. So thanks for that! (1) Price and boat: We spent considerable time searching all the available companies and boats to meet your budget and boat needs. But we do ask that if you find a better price – then you come back to us. We’d like the opportunity to talk to the charter company and find out why and rectify the difference. (2) Destination: We can also advise on best destinations and also on ones that you might not think about. Some destinations are not conducive seasonally or to your experience. How to get there: additional flights needed and travel time from the airport to base. (4) Licensing: We know the licensing requirements and work to get you qualified. The last thing you want is to show up and be told by the base that you don’t have the correct license. (5) Provisioning: Provisioning is dependent on location and since we’ve been there, we can tell you how to best plan. (6) Itineraries: Chances are we’ve been there and so we can give you the inside scoop on the best places to visit while there and which ones to miss. (7) Charter company reputation: We know which companies really take care of their boats, who has friendly staff, who charge hidden fees at the base, past client’s ratings, and more. (9) Representation: We represent YOU and your interests, not the charter company’s. (10) First time Chartering? We have the patience, time and process to ease any trepidation. All these add up to benefiting your vacation experience overall. Simply said, we are the experts at this and coordinate all the details on your behalf. There are so many to list. Each of the countries below have multiple ports of sail (locations). You could literally take a sailing vacation every year for 100 years and not go to the same place ever. A favorite starter location is the British Virgin Islands where the sailing is easy, the water is warm, there are few hazards, the navigation is mostly by sight, and there is a great selection of yacht charter companies to choose from. You don’t need to be intimidated by going to an unknown location. The charter company base there will give you a very good chart briefing before you go and tell you about lots of cool places and sometimes even their favorite restaurants. NauticEd has developed a very good chart briefing for the British Virgin Islands. If you are a bit rusty on Navigation by Charts or Electronic Navigation, built into the Bareboat Charter Master bundle of courses is a comprehensive Coastal Navigation course and an Electronic Navigation course. Some companies carry insurance so that your max out of pocket is about $1000 or so. But some companies have a much higher deductible that can be as much as $5000. You can buy down this deductible to $1k or so by paying an extra $50 or so per day. It is a good idea to know this prior to chartering and making the reservation. When we quote our charter prices to clients we always display the buy down extra insurance cost. While 99.9% of the time there is no accident – it is still possible and paying a few extra hundred while on vacation for the piece of mind is just a good idea. It is a good idea to discuss with your friends the “what if” scenario? It is a big burden on the Captain (you) if there was an unforeseen accident. Are you going to pay the $5000 deductible or are you going to surprise your friends? It is better to buy down the insurance and have everyone agree to split the lower deductible cost. Some charter companies offer travel insurance. This is in case you have a last minute medical condition that forces you to abandon your charter. Your call on this, it usually costs about $250. Some credit card companies offer travel insurance but they have $ limits and lots of rules and sometimes months of payback time. Best you check out the rules before assuming your travel (especially the entire cost of the charter boat) is covered. As Captain, you are pretty excited to sail a nice big boat and feel her heel over, but if you want to do this again you’d better make sure your crew does not get sea sick. Catamarans are fantastic for a sailing vacation and will help in reducing seasickness. The galley area is at the same level as the cockpit and so while under sail it is easy for crew members to go in and out of the galley without getting seasick. The boat does not heel over and this also reduces the likelihood of the crew getting seasick. Catamarans are more expensive but you can also put more people on them to reduce the per person expense. True, Catamarans don’t point as high into the wind as monohull but it is only a few degrees off and besides, you’re on vacation. Some people are intimidated by the size of a catamaran but as long as you are an experienced sailor, you should not have too much problem. NauticEd provides a great Catamaran Conversion Course to help understand the differences. Catamarans are actually more maneuverable under power than a monohull because of the two engines; one in each hull. Don’t too quickly discount a Catamaran. You and your crew will have a lot of fun. This is you hiring a captain (usually about $200 per day) or you doing the skippering yourself. If this is your first time ever, don’t be embarrassed that you hired a captain. 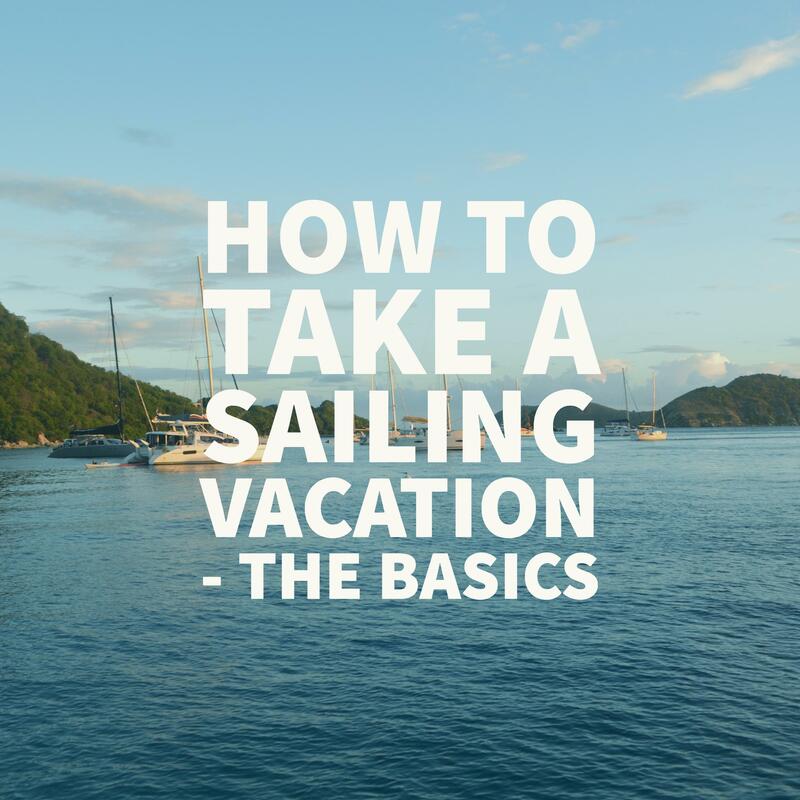 You’ll actually have a better time, you’ll probably go to all the secret hideaway spots that only the locals know about, you’ll be able to helm the boat whenever you want and you will pick up a lot of extra sailing tips from a professional. You will need to charter a boat with a separate cabin for the captain. They will not sleep on the main salon couch. A kayak and or SUP (standup paddleboard) is almost a must. Many times you can book for the number of days you want with a minimum of 6. In the Mediterranean, you have to book in multiples of 1 week starting on Saturdays. Most other places you can start and finish when you want. Sure, a luxury but the benefits… If you are going to the Mediterranean, don’t get one because most evenings you will be dining in the local villages and soaking up the culture. Week prices vary with location and size of boat and age of boat and season and … but here is a general idea for mid season costs (multiply by 1.5 or so for high season). On time on the way to charter a boat in the BVI, the airlines lost one of the crew members luggage. At the store at the marina he bought a new pair of swimming togs, a tooth brush and a couple of teeshirts. Since he was only staying with us for 4 days that sufficed him for the time. A 12-volt splitter and 12v USB plugs. This allows multiple 12-volt plugs to allow multiple devices to be charging at one time. Very important if you’re taking more than a few people on the trip. Everyone thinks their cell phone/iPod is more important than everyone else’s. You’re a hero when you pull one of these devices out of the bag. A local area travel guide like Frommers etc. Many times the charter co. will provide masks, snorkels and fins. However, if you bring your own you’re guaranteed to have a good set. Digital camera with extra memory sticks. Cheap little hand towels. The charter co. will give each person two towels for the whole week. So these little towels can serve as face and hand towels and then finally as floor wiping towels. Book of knots and a short piece of line – for the entertainment of the crew. Other Fun stuff – we really have fun on our charters and we get into the mood. One time we took a Grinch suit. Being on a boat for a week is a personality magnifier. Choose your crew mates carefully. We hope you enjoyed these chartering 101 tips. If this is your first time chartering, even if you’re accomplished sailor you can hire a captain with no shame and actually have a better time. But you don’t need to – it is relatively easy to do it yourself. You should just be an experienced sailor and know what you are doing in and around a boat and the ocean. Consider the Bareboat Charter Master bundle of courses and consider gaining the NauticEd SLC License. With the SLC, you’ll not have any issues qualifying. Experience wise, a good gauge is to have about 50 days of sailing experience; 25 of which as master of the vessel and some good skippering experience on a boat within 10 feet of what you are chartering. Anything less and the charter company will (should) turn you down as a competent skipper. Good luck out there and have a ball. NauticEd is an agent for all the yacht charter companies worldwide. We can find you the best prices and best boats. Chances are that we have been to that location so talk to us about which place is more fun and what not to miss when you are there. We don’t charge you a fee. Previous PostHow does heeling angle create airfoil shape?